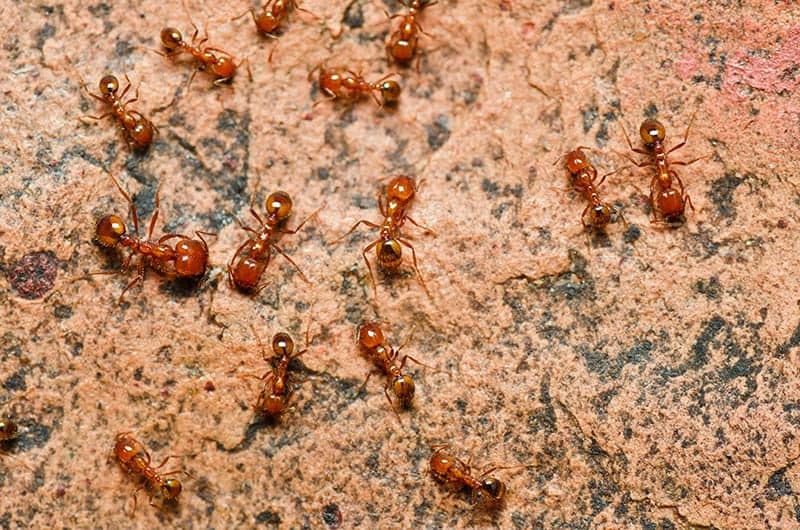 Ants are everywhere, and once you have an infestation, you’ll be hard pressed to get rid of them. And one of the worst parts is that by the time you notice them they probably already have a foothold. So, what are you supposed to do now with tons of those nasty critters invading your house or garden? Well, there are two solutions, an exterminator, or an ant-killer. And while exterminators are generally great at what they do, they can be pricey at times. Why not try the cheaper alternative first? What is an ant-killer anyways? Ant-killing products range anywhere from natural solutions meant do deal with ant infestations, to the (usually) more potent poisons meant to kill ants quick and at the source. There are tons of products to choose from currently. There are sprays, gels, traps, powders - you name it. It can be hard to decide on which to pick. Luckily for you, I’ve put together a few tips and guidelines to help you decide which type of product is best for you. First, there are two broad categories to choose from when talking about ant and pest control, in general, every product will fall into one of these: on-contact killers and slow-acting baits. On-contact killers are great for when you need to kill a bug that you see quickly without scrambling around trying to squash it; they can also be great when you know where a nest is. They’re also great for just getting in hard to reach places. Many contact killers will even have residual effects to deter ants from coming in for some period of time. The problem with contact killers is that they aren’t usually designed to kill the infestation at the source. If you spray a bunch of ants and they die, then you may have killed the ants right in front of you. But what about the nest they come from? If you don’t know where the nest is, or it’s too large for a “contact killer” to have huge effects, then you haven’t dealt with the infestation yet. That’s where the slower-acting baits come in. Baits aren’t designed to kill ants immediately. This is because, as mentioned before, if you kill an ant immediately, you still have a whole nest undealt with. Baits are designed to be very tasty to our insect friends. This means the ants will eat the bait, and the workers will take it back to their nest. This is important because the bait is very poisonous towards them, and will spread almost like a disease throughout the colony. Which then kills most of the ants, including the queen. Baits are great in multiple situations. One of the biggest being you don’t know where the source of the ants is. With a bait you don’t need to, the ants will do your work for you. Bait is also good when you’ve got an infestation that keeps coming back; it probably keeps returning because there are always survivors from your previous attempts at quelling the ant uprising. Now you know the difference between baits and on-contact products, but there’s one more problem. Even within those categories, there are quite a few different options, so why should you choose one over the other? And how do you use each one? When dealing with on-contact products, the choices usually come down to sprays and dust. Baits, on the other hand, have liquid, gel, and granular options. Ant sprays are great for killing bugs on contact. They can also be used for some hard to reach areas, but they’re usually not going to do much for actually giving long-term results. Many of them help deter bugs after the initial spray, but this doesn’t mean that the problem will be completely gone. 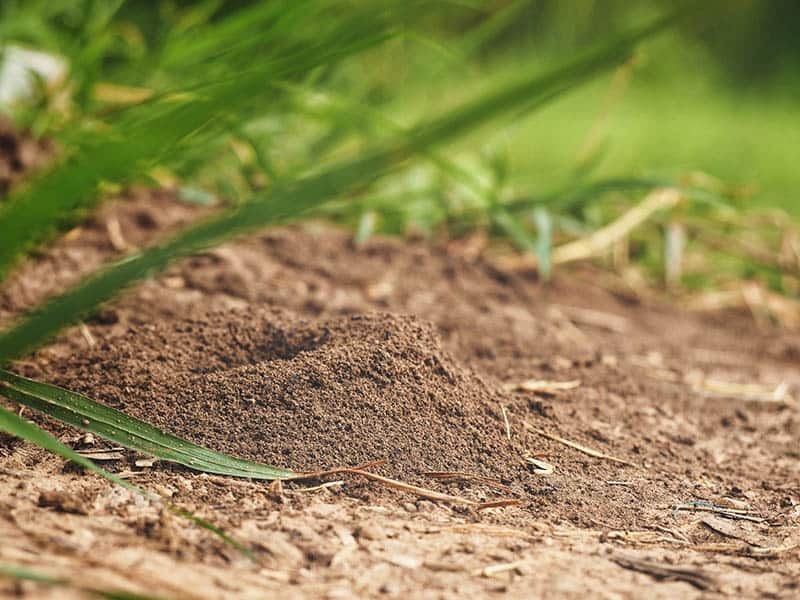 Dust is a great option if you know exactly where the source is, you’ve found common areas for the ants to pass through, or you need a product to use around the perimeter of your home. This is because usually the dust will kill ants instantly, so you can apply it directly to an ant nest, or you can make a sort of “fence” to kill the bugs as they’re trying to get in. Liquid bait usually comes in already prepared traps. So it’s a relatively hassle-free solution to an ant problem. You just place the traps near common areas for the ants to travel through, and within a few days, you should see a steady decrease of ants in your home until they’re all gone. If you have to use bait in a house with small animals and children, this is probably the best choice as the traps make it a bit harder for anyone to get to the bait. But you should still be very vigilant and keep a close eye on them. Ant gel is similar to liquid bait. The main difference is that rather than being put into a premade trap, ant gel usually comes in a tube so you can apply it directly where needed. It comes with most of the benefits that liquids have. The main difference between gel and liquid bait is that gel is easier to apply directly in hard to reach areas, while the liquid traps are a bit less setup since they’re prepackaged. Granular bait is much like the other two as well. It’s designed to be a tasty (but deadly) treat for ants. There are a few reasons you may pick one over the other though. First, granular bait is a bit messier than the other two. It’s also much more likely to be found by pets and/or children if you have any. This doesn’t mean that it’s worse than the other two, however. Granular bait is great for using around the entire permit of your house, and it’s generally the better choice if you need to apply the bait outside. Just know that rain and wet conditions generally hamper the effectiveness of granular bait. Another factor to keep in mind when choosing your ant-killer is pets and children. As with most pesticides and insecticides, these products are generally harmful to small animals and kids who might try to ingest them. If you’ve got a very curious animal or a child who likes to get into things, consider a natural solution that doesn’t make use of harmful chemicals and poisons to deal with critters. Natural remedies can work great, and some of them may even outperform their not so natural alternatives. So they definitely aren’t an option you should look past when browsing your options. Now we’ve gone over the various options you have when considering bug killers. So let’s get into specifics. We’ve put together a list of the top products for each aforementioned category. For those wanting to fight the ants head-on. Terro Outdoor Spray comes in either a 1 or 2-pack, each can comes filled with 19 oz. of spray. Being made for outdoor use, it’s able to spray as far as 20 feet away. This spray is meant to be sprayed around the perimeter of your home, as well as common entrances such as windows and doors. It kills the bugs on contact and leaves a residual that should keep them away for up to 12 weeks. It also doesn’t leave the common chemical smell that many other pesticides will. Though it’s effective against multiple types of insects and bugs, so you can use it for more than just an ant problem. The product isn’t as effective against fire ants though, so if you’ve got a fire ant problem, you should probably seek an alternative. In general, most customers are happy with this product, most saying it’s extremely effective, though there is one common complaint. 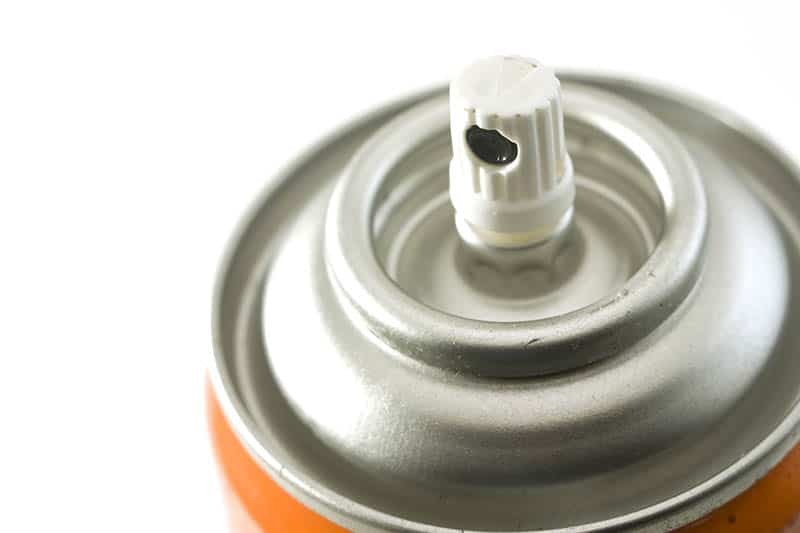 The spraying mechanism on the can is quite flimsy according to many, which can cause it to spray in unintended ways or sometimes not at all. Another spray insecticide, Raid Ant & Roach Spray comes in a 17.5 oz. can. You can purchase it in either a 1 or 2-pack as well. This spray is designed to be usable indoors, so while it may not have the range of the TERRO spray, you can use it in your home without much worry. Raid is specifically designed for ants and roaches, that means it’s not going to be very effective against many other types of critters. The spray lasts for up to 4 weeks and is supposed to kill on contact. Many customers have reported that not only does it take a bit of time before it actually kills the bug, but it’s quite ineffective against roaches as well. Another common complaint is that this spray’s can is also quite flimsy. Acting unreliable and foaming at the nozzle though the spray itself is also free of the common chemical smell. All in all, Raid Ant & Roach does do its job. And it is able to be used indoors. It’s still generally less reliable than it’s outdoor TERRO counterpart. TERRO Ant Killer Dust is another great choice for those looking for an alternative to spray options. It comes in a 1, 2 or 3-pack, each can with 1 lb. of dust. This product is great for both indoor and outdoor use. The solution itself is designed to kill many types of ants on contact, from carpenter to fire ants. It can be applied near entrances to kill ants trying to cross or applied directly to nests and crevices to strike right near the source. The dust is supposed to keep ants at bay for up to 8 months, and it’s waterproof as well. So there’s no need to worry about reapplying it after rain. When looking at customer reviews, you’ll see that there are almost no negatives. The dust supposedly works great at killing the bugs on contact and keeping them at bay afterward as well. For those with animals and children, caution is advised when using this product. While not extremely hazardous to small animals and such, it’s still advisable to keep them away from the stuff. 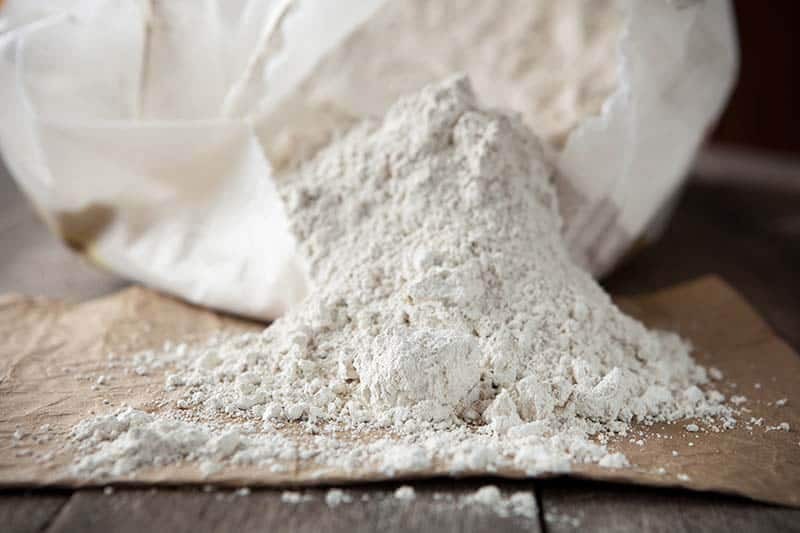 This is an interesting one, Diatomaceous Earth, or DE for short, is a food grade natural solution that has a host of uses. It comes in either a 1 or 2-pack, at 10 lb. per bag. One use of DE is a non-poison bug killer. It’s a great choice for those needing an insecticide that won’t hurt their pets or kids. But that’s not its only use, strangely enough, you can actually use it to as a dietary supplement. DE can be mixed with water and drank to provide a healthy boost to hair growth, as well as improve skin, nails, and joints. Another use it has is flea treatment for pets. Many reviewers have claimed it works great. There are a few downsides to using DE though, one of them being its lack of water resistance. It’s also not as effective at killing bugs as some of the harsher alternatives, but still, a worthwhile solution for those interested. Another option for those interested in a natural remedy to their ant problem. Natural insecticides are always a viable choice for combating infestations, though there are definitely better choices than this one. The spray comes in a 16.9 oz. bottle, and is only available in 1-packs. The spray itself does kill most ants on contact, but that’s about it. The spray itself doesn’t leave any residual effects, so it won’t help you keep ants out, nor will it help you destroy the nest. Another benefit is that it’s safe with children and pets, like many natural solutions, but that’s about where the positives stop. Honestly, there isn’t much point to choosing this spray over some of its alternatives, as it doesn’t really do much to stop an infestation. Even when you do use it directly on ants, it doesn’t always kill them on contact. The first(and only) liquid bait trap on the list. TERRO Liquid Bait Traps come in packs of 2, 3, or 6, each one comes prefilled and ready to use immediately. The traps themselves are relatively small. You just place them wherever ants are numerous and let the traps do their magic. They’re great because you don’t have to know exactly where the nest is, just where ants commonly roam, since they’ll take it back to the nest. They’re very easy to use, you just open the seal, place the trap, and leave them. Most reviewers claim that these are extremely effective in dealing with ant infestations as well. Though a very small minority said the ants in their homes weren’t attracted by the traps at all. It’s also one of the safer options out of the non-natural choices since it’s all within a contained trap, it’s going to be a bit harder for any animals or kids to get into them. As always though, caution is advised, and you should always keep an eye on kids and animals even if it’s one of the safer options. Advance’s granular ant bait is another good choice for those looking into using bait to fight their ant infestations. It comes in 8 oz. containers in packs of 1. You apply this bait as you would with the other powder-based ant killer, placing it around the most common areas for ants to travel through, and then wait for the results. But this product doesn’t kill on contact. It’s specifically designed with ants’ dietary needs in mind, so they’re much more likely to take it back to their nest. Within 24 hours of applying the powder, you should start seeing a decrease in ants. Though it should be noted that many reviewers have said the powder doesn’t work well against the larger species of ants. So when dealing with something like carpenter ants, other options are probably a better choice. If you’ve got an indoor infestation of smaller ants, this product might be worth a try. AMDRO Ant Block is an ant bait specifically made for outdoor use. So it's a great friend to gardeners who want to get rid of ants. However, if the infestation is inside your house, then you’ll need to find another solution. It comes in either a 12 oz or 24 oz. container. Every 12 oz. is able to cover around 540 feet. This bait is designed to stop the ants before they ever get into the house. Designed to kill a multitude of ant species, in most cases, you shouldn’t have to buy multiple types of bait to find the one that works against your specific infestation. There is one exception that’s been found so far; a few people are saying that Argentine ants(commonly found in California) aren’t really affected by this bait. The bait itself lasts around 3 months before you’ll have to reapply, though at that point the ants will probably be dead already. Almost every reviewer for this product is satisfied. Many of them even claim that all of the ants they were dealing with were dead within the next day. Combat max is an ant bait gel that comes in 27-gram tubes. You can get it in a single pack or 6 at a time. It’s pretty similar to a liquid bait trap. The main difference is that you have to apply the gel directly to an area rather than placing the trap. The gel container itself is designed to be hard for children to get into, and the gel itself doesn’t leave a mess. It’s made for both indoor and outdoor use and comes in a syringe so you can get to those hard to reach areas with it. It’s supposed to start giving you results within 3 to 5 days, but there are quite a number of negative reviews disputing this. It appears that at some point Combat switched their formula, and many have claimed that the current gel isn’t very effective at enticing the ants. Though some are still reporting very good results from the product, so it’s hard to say whether or not it’ll work for you. The other most common reason for negative reviews is the small amount of gel you actually get with the product when compared to alternatives. Advion ant gel comes in packages of 1.06 oz. each. Right out of the gate it’s probably the most inconsistent out of the choices besides Aunt Fannie’s Spray. Advion claims that the formula itself is made to attract ants of multiple species. Like other baits, it works by having the ants carry the gel back to their nest, which is great. Each tube comes with 2 tips for different types of application each, which is a nice addition as well. The reviews themselves for this product are very split though, some of them claiming the product worked great, while others claim it didn’t work at all. Some of the most common complaints are a very strong odor that comes from the solution itself. Many have also said that their gel was expired and very runny. While for some this product has worked great, the results just don’t seem consistent enough for this product to be worth it. Overall, it’d probably be a better choice to go with one of the more consistent alternatives. There are plenty of great options when it comes to picking an ant killer. The one you pick really just depends on your specific needs. The overall top pick would have to be TERRO Ant Killing Dust. You can use it to prevent ants from entering. You can also directly apply it to them or their nest. The only big problem is it might be a pain to use in hard to reach areas. That doesn’t mean it’s the only option, though. For those who want a safer, more natural alternative, Diatomaceous Earth is great too, and you can even use it as a health supplement. For those who want an easy way to deal with ants without much hassle, liquid traps are definitely a good choice. And for those who need a way to deal with ants directly, either of the sprays is fairly good choices as well, depending on whether you need them for outdoor or indoor use.